Update: An earlier version of this story had a headline that suggested only one of GO Launcher’s apps had 80 million monthly active users, when that user base is, in fact, spread across all of its apps. As I’ve written about before, while the Chinese startup scene is sometimes criticized for producing copycats of Western businesses, there are emerging entrepreneurs building software products with global appeal. One of the startups with the largest reach is GO Launcher, a Beijing-based company making an Android homescreen with apps that boast 80 million monthly actives and three Android products with more than 50 million installs each. The company has taken three rounds of funding in the “tens of millions” from investors like IDG and WI Harper, although the company declined to specify how much it’s taken. Xiangdong Zhang, one of the co-founders, help set up the company about a decade ago when it was a portal for the mobile web — a super basic WAP portal. “It was like Yahoo for the mobile Internet,” explains Shenxin Xu, a spokesperson for the company. He said that back in the mid-2000s, Go Launcher’s 3G portal product used to consume as much as one-third of the bandwidth for mobile Internet usage in China. But they later switched to an Android-centric strategy about three years ago, just as the platform was poised to take off in mainland China. It was obvious that a WAP strategy wasn’t going to be successful in the long run. So they launched a series of products including GO Launcher Ex, which lets customize their home screen with more than 10,000 themes and GO Locker, which lets Android users open apps directly from the lock screen or add more security protection with extra pins, patterns and gestures. Now GO Launcher’s biggest audiences, in fact, aren’t in the mainland. They’re in the U.S. followed by South Korea, another major Android market thanks to Samsung’s dominance there. “It was a global product from the beginning and then it moved back into to China,” Zhang said. Over the last two years, Android has far surpassed iOS as the dominant smartphone platform in mainland China, thanks to a wave of low-end handsets. GO Launcher, which now has about 800 employees, earns revenue mainly through advertising, a premium paid version of the product and providing distribution for third-party apps. Half of the revenue comes through the largest couple of GO Launcher apps. 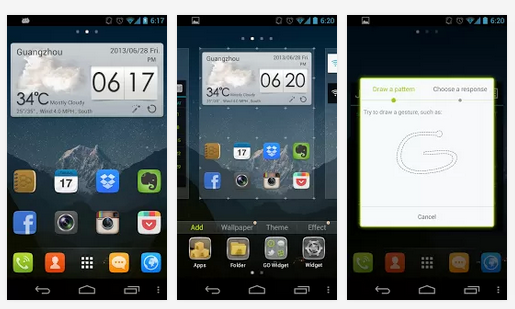 They sell themes for GO Launcher at $2 each, then a premium version of the app for $16. They also earn revenue for distributing third-party apps through a small app store widget in the launcher, plus an exchange with Getjar, the Accel-backed independent app store. There are also ads directly in the product from Google’s mobile advertising network.